i thought $meta worked in queries but having just looked, it doesn't. Yes, I was horrified to find all my play stats at 0, prior to discovering that feature. I just right-clicked on the root of my music folder, and it imported all my tags. Note that it's a good idea to close foobar after doing this, because I had a crash, and my play counts went back to 0, and I had to do it again. Once again marc: thank you. Thanks Nemphael for the tip. if album artist tag exist and is not different then those tracks will share the same statistic. XML output doesn't have "artist + album + disc number + track number + track title" information literally, but instead root Mapping attribute and child ID. Maybe one of the reasons is to write/read it as fast as possible, which really is. How can real data be revealed using those two element attributes? Thanks for the great work, I'm a long time foobar user! I have several albums as CD and vinyl, with all tags equal except the %format% tag (and catalog nr. etc. as per Discogs spec). Now CD and vinyl versions of the same album have the same statistics and %added% date. A way of defining which tags are used as keys to the statistics database would be greatly appreciated! Suggest referencing the Wiki article for this new version. Playback statistics are now pinned to a combination of artist + album + disc number + track number + track title information, contrary to pre-3.0 versions which would pin data to file paths. * Statistics are shared between redundant copies of the same tracks - useful when you keep separate copies of your music in different formats such as lossy + lossless. 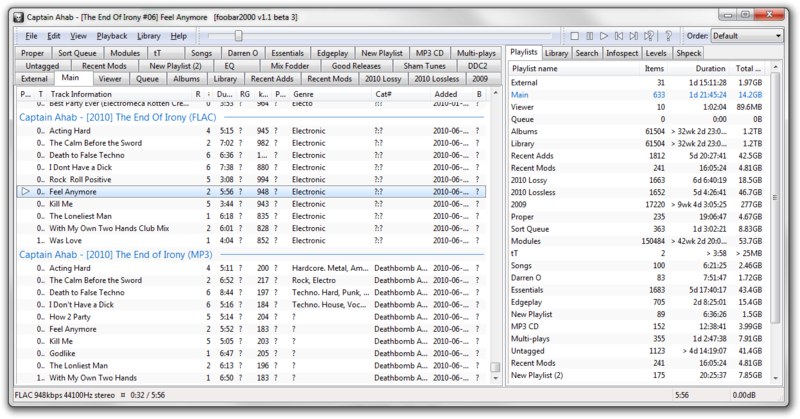 * Automatic carrying over of statistics when acquiring the same music in another format, as long as tags match. * No risk of data loss when moving files around or between computers. I understand, and I also read the Wiki. I like the idea behind the new version and also think that it is a better way of handling things than the old version. I agree that this is the intended behavior for albums which have the same source format (e.g. CD) but are stored in different file formats. But for me, the CD and the vinyl version are not the same and should not have the same statistics, and especially not the same %added% date. If I want to keep track of when I bought an album on vinyl, that would not be possible when I already have it on CD. Also, sometimes, the CD and vinyl have different songs on them, or the order of some songs is switched. Then those switched songs have different statistics on CD and vinyl, and all other songs share the same. I know that I could append the %format% info (CD vs vinyl) to the %album% tag, but that would confuse other tools like the AlbumArtDownloader. It would not interfere with the current behavior of the plugin if there was an advanced option to define the combination of tags to use as key to the database. Actually, "Mapping" attribute value is the name of playback statistics index file located in %appdata% foobar profile or index-data subfolder for portable installation, and has the same value for any user. IMHO playback statistics data file needs to be encoded somehow, but not to the point of not being accessible by scripting languages or similar programmatic tools. Main media players does exactly that. I just discovered that, according to the playback statistics*, I listened 8184 times to a recording of the Well-Tempered Clavier (WTC). Now, even if I really listen to that a lot, that can't be possible. You might ask why I don't put the name of the piece in the %title% field, but I have worked out my system that way after trying out several things, and I'm now happy with it. It avoids redundancy and can be used consistently for various types of classical music and other music, as well. It's one of the things that I like so much about foobar2000 and I won't give that up. The first visible column to the right of "Track Information" is the the play counter. I like to approve what vanishing already said: it is strange to see that tracks inside one album change their added date. I guess i feel so because this date i consider more file related than playback related. I think there is nothing that can be done about this? That would be the file creation date which unfortunately is not accessible in foobar. The closest thing related is the last modification date aka %last_modified% which initially is equal to the creation date (ie the date the file enters the Media Library), until the file is eventually modified (tagged inside or outside foobar for example). As it is, all files that resolve to the same hash will share the same %added% as well as other statistics. I can not get the rating to display as a number or starts. I know its getting set because it show in the song's properties. If I put %rating% it just shows ?. If I put (%rating%) it shows up as blank. Do I need the foo_rating2 to make it work? I am running the just released 1.1 but it did not work in the last beta as well for me. Did you try to "import statistics from file tags" in track context menu? If you write the rating directly to the file (via masstagger script or wsh panel script) it may not appear in statistics. Correct me if I am wrong but I am sure that's the way it works. Btw. I noticed faster File Operation (move files etc) with new Playbackstatistics. Maybe because the stat database doesn't depend on filepaths. Playback statistics 3.0 is just brilliant, thank you! the statistics are also pinned to DATE! this is kind of annoying if you use a combination of foobar2000 and Traktor (DJ software) that rewrites your DATE field in the format: YYYY-MM-DD. would it be possible to remove the DATE field from the data pinning scheme or at least keep it only for the first 4 digits (YYYY)? OK that worked - but are you telling me that every time I set a rating I also have to do this as well?? That is not nice. Is there a way to fix this and just make it work? Also I get a ? on all tracks that are not set - can you show me a way to eliminate this? If you use a masstagger script with keyboardshortcuts (like me) then write the id3 rating tags back to statistic db over the full library. once a week or so. Or you use keyboardshortcuts and map them to the original Playbackstat rating contextmenu but then no rating tag in files anymore. Or if you just want to display your rating tag in a playlistcolumn without using the component, then set a column with $meta(rating) instead of %rating%. This will use the filetag. And if you use something like [%rating%] (square brackets) then the ? symbol disappears. I think that's all possible ways. Maybe someone have another hint. I keep my main library in FLAC, and a mirrored copy (identical to the tags) in lossy for my portable devices. Both libraries are indexed in the same foobar. Playback statistics keeps playcounts and ratings for both sets of libraries, but the playcount is obviously different, and the rating, while I try to manually synchronize, may also differ. What is going to happen when I upgrade to 3.0? Upon upgrade, will it (A), take the higher playcount - 30, (B), merge playcounts - 40, © or do something else. Option B would be my preferred treatment. And will it have the same playcount for both files? I reckon it will from what I've read. Also, ratings is probably not going to be a consideration. I'm going to try and go through my whole library and manually synchronize before I even attempt the upgrade. I have tried "writing stats to tags", changing the tags, and then re-importing ....this had no effect. I have also tried exporting a songs stats to XML, resetting its stats via the context menu, manually editing the file, and then re-importing via Library -> Playback Statistics -> Import Statistics .... I can change all other stats except the "Added" date....it just stays the same (the "Added date" checkbox is selected in the import dialog). Any ideas? And does anyone else have a problem changing a songs added date ? Added date = date added to library. Static. It is not intended to be editable.